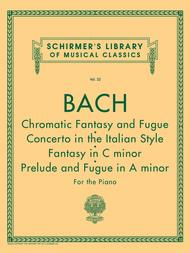 Schirmer Library of Classics Volume 22 Piano Solo. Composed by Johann Sebastian Bach (1685-1750). Piano Collection. Concerto, Classical, Fugue, Baroque, Prelude, Italian. Softcover. 60 pages. G. Schirmer #LB22. Published by G. Schirmer (HL.50252120). 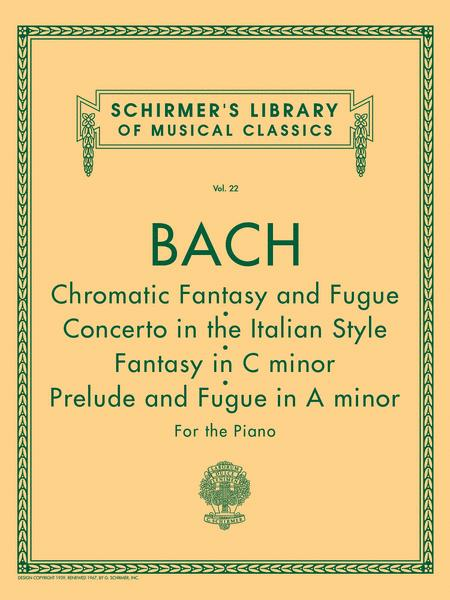 Contents: Chromatic Fantasy And Fugue In D Minor, BWV 903 • Italian Concerto In F Major, BWV 971 • Fantasy In C Minor, BWV 906 • Fantasy and Fugue In A Minor, BWV 944.